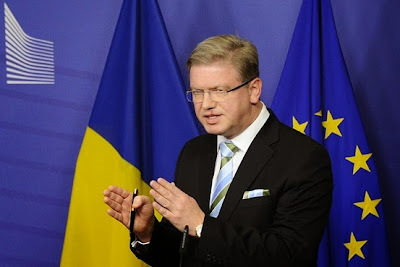 NEW YORK, USA -- The European Union seemed set for a fresh clash with Russia after the bloc's enlargement chief, Stefan Füle, accused Moscow of living in a "virtual reality" over its interpretation of a recent deal aimed at defusing trade tensions over Ukraine. EU enlargement chief Stefan Füle, pictured in Brussels, has told The Wall Street Journal that the Russian government is living in a "virtual reality" over its interpretation of a recent compromise trade deal involving Ukraine. The dispute threatens to dampen hopes that a Sept. 12 accord between the EU, Russia, and Ukraine could start to ease tensions between Brussels and Moscow. Last week, Russian Economy Minister Alexei Ulyukaev sent a letter to the European Commission's trade chief and Ukraine's foreign minister setting out Moscow's interpretation of the agreement and warning that Russia could still retaliate against Ukraine for ratifying a broad trade and political agreement with the EU. According to European officials, that Sept. 12 compromise was based on a Russian promise not to retaliate against Ukraine for ratifying the so-called association agreement with the EU. In return, the EU agreed to give Ukraine 15 more months before it starts implementing key parts of the agreement related to trade, even while extending its zero-tariff regime for most Ukrainian exports. That would give Russian firms more time to adapt to the accord. Russia has fiercely opposed the association agreement, arguing it will lead to a flood of EU imports entering Russia and undercut Russian exports to Ukraine. The Kremlin had threatened to retaliate by ending its preferential trade relationship with Kiev, a move that could deliver a fresh blow to Ukraine's tottering economy. Many European officials feared if there was no compromise, Russia could sow fresh trouble in eastern Ukraine, where a fragile cease-fire has subdued a full-blown conflict between Kiev's government and pro-Russian separatists. Russia denies orchestrating or supporting the rebels. A copy of the Russian letter reviewed by The Wall Street Journal warns that Russia could still retaliate against Ukraine for ratifying the pact. The letter says Ukraine must not implement any of the provisions of the association agreement, even though Brussels says the compromise froze only some parts of its chapter on trade. Moscow also demanded a mandate for future talks, specifying that the three sides should prepare amendments to the accord. EU officials have insisted repeatedly they won't reopen the text of the agreement. EU officials said Russian President Vladimir Putin wrote a similar letter to European Commission President José Manuel Barroso. In an interview with The Wall Street Journal on Monday, Mr. Füle said the EU and Ukraine would soon reply to Russia. He said Moscow's demands went far beyond anything agreed. "You could compare the texts. You just need to put together the text of what has been agreed and what the Russian interpretation is to understand that this interpretation is from a different world, a parallel world," he said. "We are committed to" dealing with "real issues, real problems and finding real solutions. The Russians will have to abandon this virtual reality." Mr. Füle, the Czech commissioner who is EU's point man on Ukraine relations, said he didn't want to prejudge whether the Russian letter implied Moscow didn't enter the Sept. 12 deal in good faith. The September deal raised hopes among some in Brussels that Moscow would start to be more flexible in its approach to the bloc. Some EU officials hoped it could open the way to resolve other problems, like the talks over a standoff between Ukraine and Russia over gas supplies. The EU has gradually escalated sanctions against Russia in recent months over what it says is Moscow's meddling in Ukraine. In late August, Mr. Barroso warned that ties between the two European giants were nearing a "point of no return." The EU has long dismissed most Russian complaints about Ukraine pact, saying Moscow's real concern was losing its leverage over Kiev. However Brussels officials hoped the 15-month delay on the trade provisions would give Ukraine's economy time to recover, weakening the threat of any eventual Russian retaliation. The Sept. 12 deal didn't bind Russia to refrain from retaliating after Dec. 31, 2015, if Ukraine starts to implement the agreement fully.